DARK ZETA testing. . .
CLICK on Thumbnail! Still in progress! Version 0.05a! Note: Then click on the screen and press enter! So! Currently I got up to version 0.12 and I split up the game into two! Is kinda of a volume set you can say. I won’t have it up now for everyone to play (only the special selected folks can try) but I plan to get it out by the end of January. As well I wanted to mention that Vol 1 is branded as Arcade, while Surreal Attack is Vol 2. The difference I shall disclose it in a video coming soon a few days. I’m currently working on a super major video that’s in HD for no reason just to take up more screen space! lol I will disclose the progression of this month and Novemeber, as well as show my new years resolution and plans for 2013. 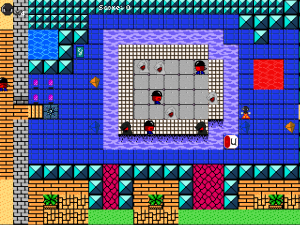 This entry was posted in DarkZeta and tagged DarkZeta, indie game. Bookmark the permalink.